In this presentation the award-winning journalist withThe Guardian, David Conn, drawing on his best-selling book, The Fall of the House of Fifa, will discuss the history behind, and leading up to, the extraordinary events that culminated in the arrest and multiple indictment of a number of FIFA Executive Committee members, and the resignation of many long-term FIFA executives most notably the FIFA President Sepp Blatter, in 2015; including an account of an extended interview with Sepp Blatter in which the critical corruption allegations are addressed directly. Founded in 1904 FIFA is the world governing body of football, and states in its statutes (2a) a key objective “to improve the game of football constantly and promote it globally in the light of its unifying, educational, cultural and humanitarian values”. It is also the organiser of the FIFA World Cup, along with the Olympic Games the most financially lucrative sport event in the world. In this presentation David Conn explains how the power and prestige that has followed FIFA’s central role in world football led to the most extraordinary corruption scandal in the history of the world’s leading sport of football, and discusses what the implications are for the future governance of international sport. David Conn is an award-winning journalist, author and broadcaster. He writes for The Guardian newspaper and is the author of four acclaimed books. His most recent, The Fall of the House of FIFA (2017), and three which chronicled and critically analysed English football’s commercial transformation: Richer Than God: Manchester City, Modern Football and Growing Up (2012), The Beautiful Game? Searching for the Soul of Football (2004), and The Football Business (1997). He has been awarded UK sports news reporter of the year three times, and sports journalist of the year in the British Journalism Awards. Notably, he is particularly well-known for his committed and forensic investigations of the 1989 Hillsborough stadium disaster in which 96 people died, and its aftermath, highlighting the long campaign for justice by the bereaved families which culminated in verdicts at the new inquests last year. Conn. D. (2017). 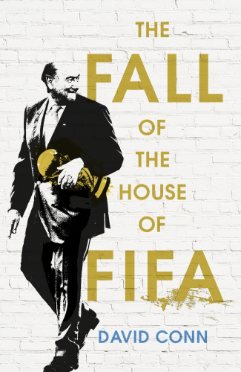 The Fall of the House of FIFA. Yellow Jersey.